Leonardo assisted his master Verrocchio on this altar-piece, painting the angel kneeling at the far left, and repainting parts of the landscape and the body of Christ. 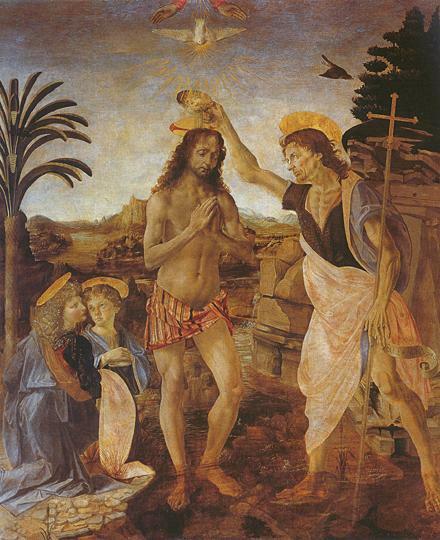 Verrocchio had already done the main work: "Leonardo painted an angel who was holding some garments; and despite his youth, he executed it in such a manner that his angel was far better that the figures painted by Verrocchio. This was the reason why Andrea would never touch colours again, he was so ashamed that a boy understood their use better than he did."